Sea Buddies™ Concentrate! / 60 Veg Caps - Nature's Way®. Take 2 capsules one to two times daily. Do not exceed recommended dose unless otherwise recommended by a healthcare professional. Capsules may be opened and mixed with your child’s food or beverage. Not recommended for children under four years of age. Caution: Do not take this product if you have epilepsy or a history of seizure disorder. If pregnant, nursing, or taking any medications, consult a healthcare professional before use. Should I give Sea Buddies Concentrate! to my child on a daily basis or only as needed? Sea Buddies Concentrate! was developed in conjunction with Jeff Bradstreet, MD a Fellow of the American Academy of Family Physicians. Dr. Bradstreet encourages parents to discuss the use of Sea Buddies Concentrate! with their child’s doctor or other healthcare practitioner. On the Sea Buddies Concentrate! label, we recommend that parents give their children two Veg. Capsules daily and monitor focus and concentration levels. * If needed, parents can increase the dose until desired results are achieved, repeating this dosage as needed throughout the day. 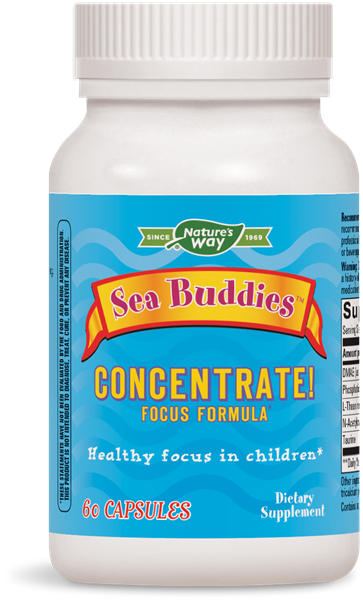 Do not exceed ten (10) Sea Buddies Concentrate! Veg. Capsules daily unless directed by a healthcare practitioner. My child suffers from allergies. Does Sea Buddies Concentrate! contain peanuts, tree nuts, banana, sugar, salt, yeast, wheat, gluten, corn, dairy products, artificial coloring, artificial flavoring, preservatives, or eggs? No, Sea Buddies Concentrate! contains none of the ingredients listed above. We encourage you to discuss its use with your child’s doctor. Can I open the Sea Buddies Concentrate! capsule and pour it on my child’s food? Yes, as an alternative to swallowing capsules, the Sea Buddies Concentrate! capsules may be opened and mixed with your child's favorite food or beverage, such as apple juice, applesauce, and yogurt. Are any ingredients in Sea Buddies Concentrate! derived from nuts?